The “buy me some peanuts and crackerjacks” theme of baseball is no longer as simple as it seems. It’s more like “buy me some pulled pork BBQ sandwiches, funnel cakes, foot long chili cheese dogs and some chocolate covered strawberries.” The new lyrics don’t quite roll off the tongue like the original lyrics. However, these days the dining experience is just as important as the game. This season, Kauffman outdid itself and created new menus full of exotic and crazy foods. 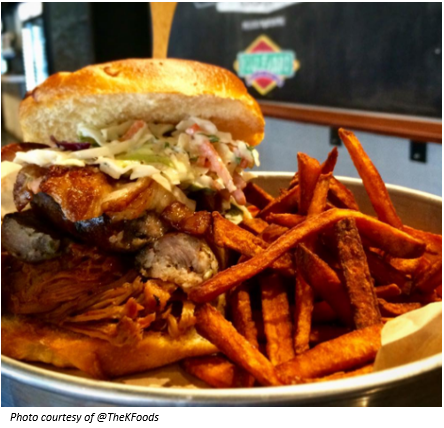 From massive sandwiches to finger dessert foods, Kauffman Stadium has it all. Coming up as the first and foremost item to check out, ranked as #2 in USA Today’s Craziest Ballpark Foods, is the Pulled Pork Patty Melt. What is it: Funnel Cake patties, BBQ pulled pork, fried onion, topped with both cheddar and jack cheese, crispy bacon and a jalapeno skewer. Chance of leaving the ballgame with a stain: 9/10- You’ll need a few dozen napkins and may want a table to eat this. 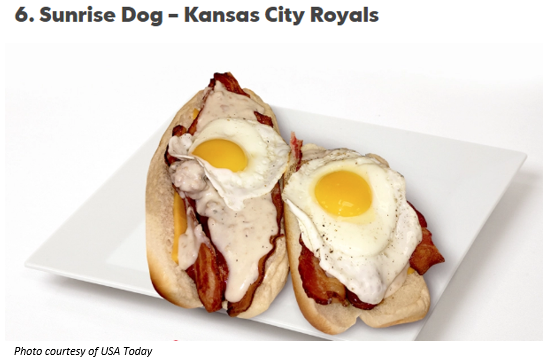 Next we have the $6 ranked Craziest Ballpark Food, Kauffman Stadium’s Sunrise Dog. 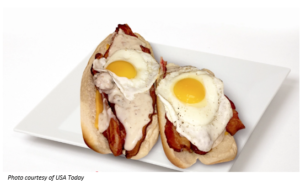 What is it: A foundation of buns, topped with a hot dog, cheddar cheese, bacon, white sausage, sunny side up egg and smothered in gravy. Chance of leaving the ballgame with a stain: 10/10- Napkins, on napkins, on napkins, but that gravy sure does run smooth. Vegetarian? Wanting something lighter? 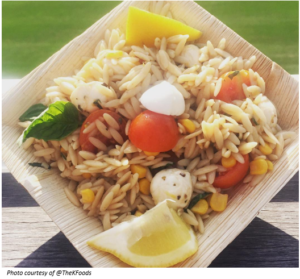 You’re still in the right place with Kauffman and their Summer Orzo Salad. What is it: Orzo pasta, cherry tomatoes, fresh basil, fresh mozzarella, lemon and drizzled with balsamic. Chance of leaving the ballgame with a stain: 1/10- Those cherry tomatoes might get ya. Meat lover’s listen up, your go to food purchase at the K. The Triple Threat Sandwich ain’t no joke. Warning, the food coma hits you for at least three innings. 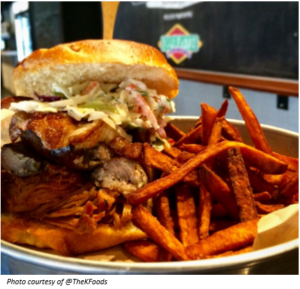 What is it: Chipotle BBQ pulled pork, jerk sausage, pork belly, apple slaw and more BBQ sauce, plus a side of sweet potato fries. Chance of leaving the ballgame with a stain: 10/10- You may want to reach for the silverware for this one. 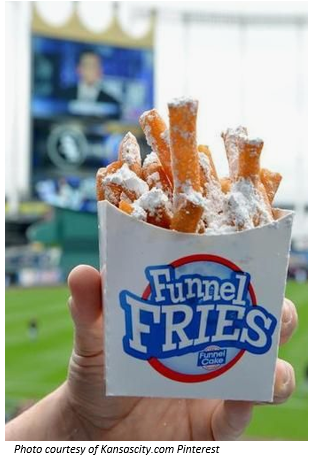 Not everything at the K is comfort food and loaded with meats. The Baby Spinach Salad is delicious, healthy, fresh and guilt free. 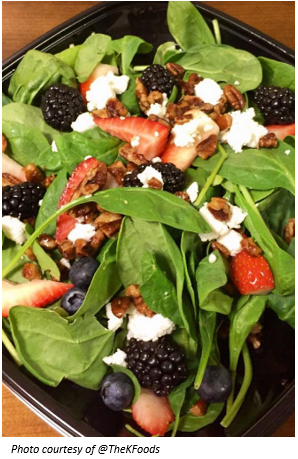 What is it: Spinach, blackberries, strawberries, blueberries, goat cheese, candied pecans and vinaigrette dressing. Chance of leaving the ballgame with a stain: 2/10- Salads are easy to fork but watch the berries when you mix around the dressing. Craving a nice hardy sandwich? Kauffman Stadium’s amped up BLT Cheese Sandwich will leave you full but still wanting more. 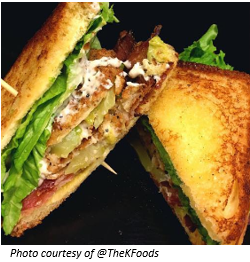 What is it: Applewood smoked bacon, avocado, fried green tomato, Bibb lettuce, black pepper aioli, butter grilled Texas Toast. Chance of leaving the ballgame with a stain: 4/10- You’ll need a few dozen napkins and a table could do you some good. Want something that won’t leave your hands a mess but something more than a salad? Look no further than the Spicy Coconut Curry Chicken Bowl. 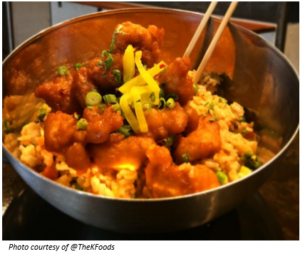 What is it: Rice and deep fried pieces of chicken mixed with spices, curry, coconut, scallions and peppers. Chance of leaving the ballgame with a stain: 5/10- Rice always finds its way out of the plate and onto your lap, it’s a given. 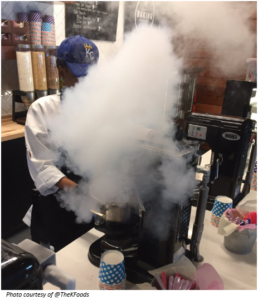 What is it: Ice cream blended with liquid nitrogen to create a smoother, creamier texture. Chance of leaving the ballgame with a stain: 4/10- Hot summer days call for some ice cream, but also calls for a few drops on the tshirt. With or without the Royal’s helmet bowl, the Royal Turtle Sundae knocks it out of Kauffman Stadium every time. 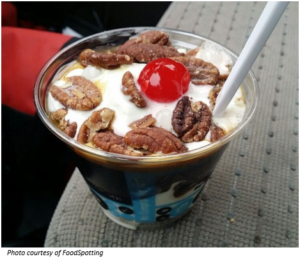 What is it: Vanilla custard, hot fudge, caramel, roasted pecans and a cherry on top (as always). Chance of leaving the ballgame with a stain: 4/10- Spoons normally find their way to your mouth, but sometimes they have a mind of their own too. Apart from peanuts and nachos as the classic finger foods of baseball, the new Funnel Fries are coming in to become listed as one of the best in Kauffman Stadium. 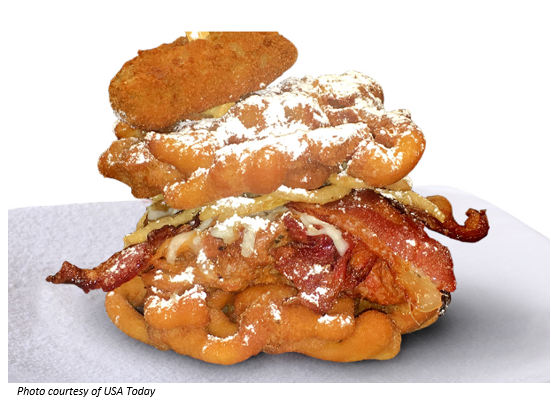 What is it: Funnel cakes turned into finger foods… what more could you want? Chance of leaving the ballgame with a stain: 1/10- Save yourself the stain and lick the powder off your fingers, don’t wipe them on your shirt.